What’s the Big Deal about Pumpkin Pie? The Pilgrims did have pies and pumpkin at their first Thanksgiving but the pumpkin wasn’t in the pie form we know today. They didn’t have many of the ingredients. In Colonial times autumn was pie making season. Pies were made to put away for later in the year. Cold cellars, acting as refrigerators or even freezers, would preserve pies for months. Mincemeat pie was popular because it preserved the meat. Today you don’t see it a lot of mincemeat on holiday menus but back then people were happy to have a way to stock up and not have their meat go to waste. When Thanksgiving was first celebrated it was the major holiday of the year. Birthdays weren’t recognized and Christmas was for religious people. Religion was a big part of Thanksgiving with some people attending two sermons a day but it was also recognized in New England by Quakers and others who went to Meeting Houses and not churches. It was about giving thanks in general. Thanksgiving originally was not on a set day. A dignitary would select the day, anytime between the middle of October and the end of December. Each colony and then later when there were states, each state would celebrate when they chose to. Thanksgiving became a national holiday when President Lincoln decided it would be on the third Thursday of November. We should celebrate the pumpkin this time of year as it is in season and grows locally practically everywhere. There are lots of wonderful things to make with pumpkin for dessert- cheesecake, cranberry pumpkin pecan upside down cake, pumpkin steamed pudding, pumpkin ice cream with caramel sauce. You don’t have to stop making pie, let’s just move beyond it and offer something new. Here’s a pumpkin recipe for something different. If you want to make pie, email me and I will send you a really good recipe. Even though it won’t be on my plate this year. You can make this a day in advance. Store at room temperature wrapped in plastic wrap. Preheat the oven to 350 degrees F. Line the bottom of a 9-inch square pan with parchment paper. Melt the butter in a small saucepot over medium heat. Add the brown sugar and whisk until smooth. Pour the brown sugar mixture into the bottom of the cake pan. In a medium bowl combine the cranberries and pecans. Place them in the pan over the brown sugar mixture. In a large bowl, whisk together the eggs, pumpkin puree, and oil. Sift together the flour, sugar, baking powder, cinnamon, and salt. Stir the flour mixture into the pumpkin mixture. 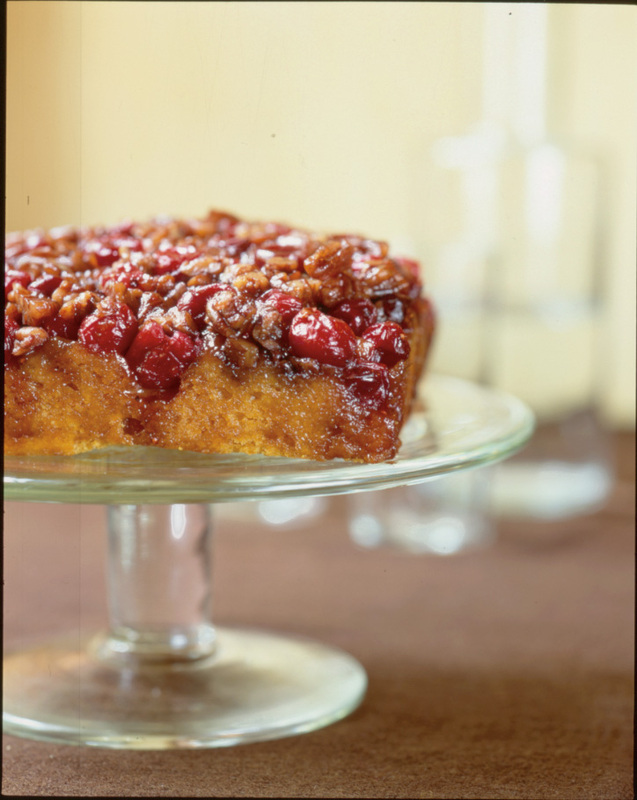 Carefully spread the batter over the cranberry pecan topping. Bake until a skewer inserted in the middle comes out clean, 35-40 minutes. Cool the cake for 10 minutes on a wire rack. Place a large plate or platter on top of the cake. Invert the cake and plate together. Remove the pan. Carefully peel off the parchment paper. Cool completely before serving. Serve with Chantilly Cream. Combine all of the ingredients and whisk until soft peaks form. Refrigerate until you are ready to use.